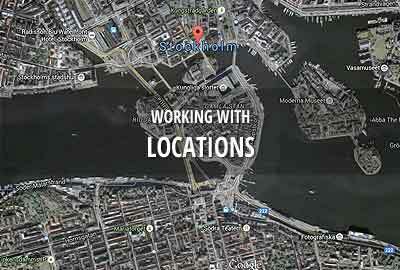 Location management is a crucial task in most productions. Forget excel lists, difficult image sharing, badly copied map handouts and having to add manual weather updates in the call sheet. Dramatify do it elegantly and automatically! 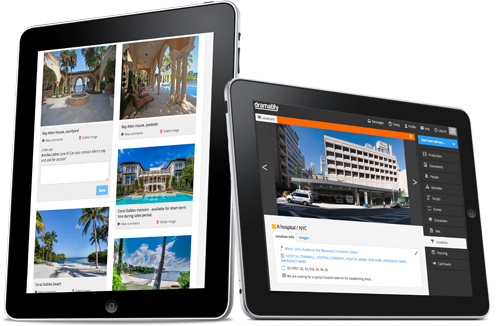 Dramatify adds locations, maps, weather & driving directions in conveniently in your and your team members’ mobiles, tablets and laptops. You also get a location list you gradually build out during preproduction. We offer shooting locations, unit base and medical emergency locations. You connect your set to your locations so your team have all location info in the scene list, in the set list and in the call sheet. You can add location images to all your locations. A thumbnail will be shown in the location list. 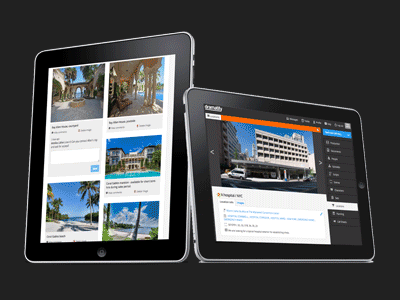 On each location page you’ll find both a header image slideshow and an image board with comments that gives you overview and collaboration. Clicking any map link gives you traditional maps, satellite maps and – if available – Google Streetviews. Add your current location and you’ll get driving directions with time estimates, or public transport alternatives. Based on the shooting location, we automatically adds a ten day, rolling weather forecast in the call sheet, updated every third hour with general weather forecast, temperature, wind, sunrise and sunset. If you are in an area that is very special from a meteorological point of view, you can instead add a manual weather report. Built into the location list, is also a location report which you can customise according to your own needs, or print to send to others. The people and production in the photo have no relation to Dramatify. 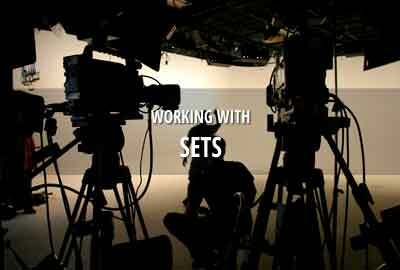 Sets & set scene items! Dramatiify’s feature for sets give you set list and set pages with all set information including scenes and scene items. 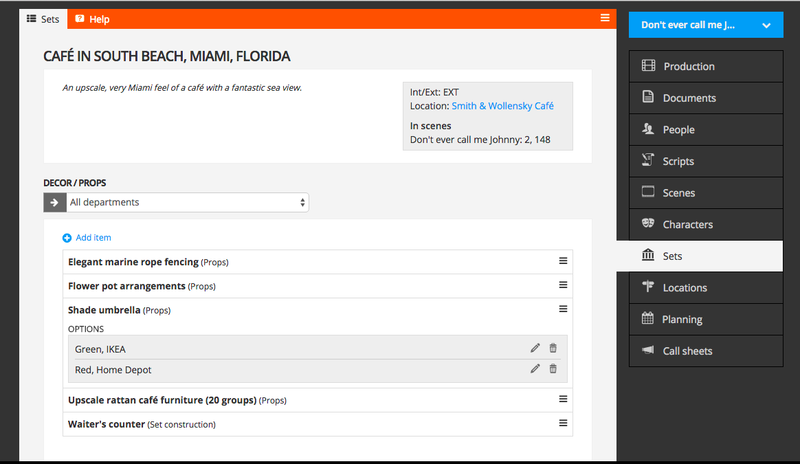 Sets are also interconnected with all other production information in Dramatify. Where do I find sets? Just click on “Sets & Locations” in the sidebar menu. In some screenwriting and scheduling applications, the terms set and location are used quite interchangeably. In Dramatify however, these are two very different things. Sets are the theatrical scenery, the set construction where the action takes place. Locations have GPS coordinates. You can have many sets at one location, like at a big sound stage, but you can not have many locations for one set. If that is the case, you need to add more scenes to your script since the general principle in screenwriting is that a scene shouldn’t require moving the camera. If you interview a researcher in a university lab, the lab, where the filming takes place, is the set and that is tied to the location which is the university. In the call sheet, you then have the correct address, map link and driving directions as well as updated weather forecast for the university, and under Scenes & Set see exactly where the filming is going to take place for the different scenes. A set usually have a location, but doesn’t have to. With the increasing use of CGI, you might have a set of a space battle, but naturally no location as this scene will be produced digitally. 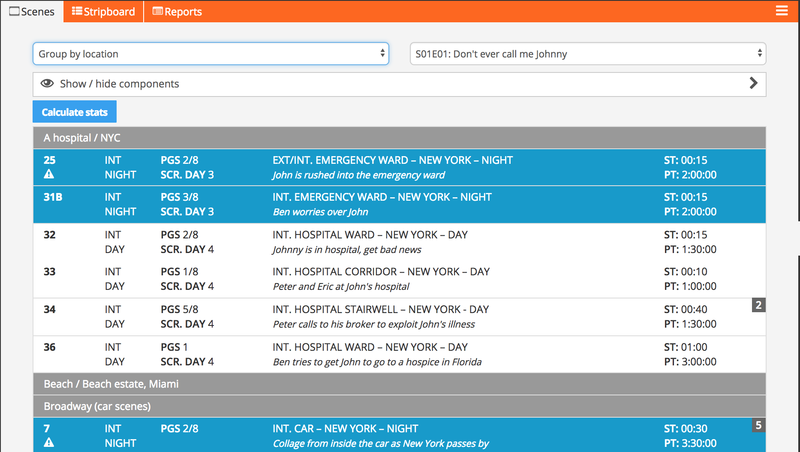 In Dramatify, you can assign all such scenes to a specific team, and give them their own call sheet without any locations other than the office as a unit base. You learn more in depth about Locations here. In most fiction productions you will import your sets when you import your fiction screenplay. We recommend that you go through the set listto remove any screenwriter or software errors. After import, just click on Sets. There might be misspellings that create two sets where there should be one, screenwriter errors that names one set “Anna’s kitchen” and another “Anna’s house / Kitchen”, even though the should be the same or screenwriting techniques like adding an “insert” or a “back to” in the slug, that automatically creates a set called “back to”. That set should be deleted of course. To edit or delete a set, click on the set name in the set list and then on the edit menu in the toolbar. Choose edit set or delete set. Imports from some screenwriting software also adds the entire slug as the set so you manually need to go in and correct this. If you want correct strip board colors, you should also go to each scene and help Dramatify to know if it is an interior or exterior set. You can also add any description or information you’d like. To add a set manually, click on Sets and then use the edit menu to the right in the toolbar to click on Add Set. You add the name and select if it’s an interior or exterior set. You can also add any information or description to the set if you like. If you have added a location, you can link the set to the correct location, or do that later. Click to save. You can at anytime add and edit information on the set edit page. If you write your screenplay directly in Dramatify, or do a non-fiction production using our AV scripts, it might be faster and more convenient to add sets during breakdown. To navigate to the breakdown, you click on Scenes and then on Breakdown in the toolbar. The Breakdown is how you, amongst other things, link together scenes with sets and Time of Day in order it add correct strip board colors for scheduling and call sheets. You add sets in the top left hand part of the page. Above you have the scene text as a reference. To add a new set, click the link. As you will see, the form is the same as on the Add set page. When you also have added the Time of Day – dawn, day, dusk or night – the lightly striped background of the slug (i.e. the scene headline] will turn into a correct strip board color. The lightly striped background is a warning sign in the breakdown, scheduling and call sheets that a scene isn’t broken down properly. A slow internet connection that doesn’t send the signal for the slug to change color. Save your settings at the bottom of the column, then click to go to the next scene at the top, and then go back again. If the background of the slug is still striped, check the beginning of the set. If it doesn’t say INT or EXT, you need to go to Sets and edit your set. More below! While you add sets in the breakdown, you can also add any scene items that is mentioned in the scene text to sets. You also link the scene item to which department that should be responsible for it. Everytime you add a set that you already have added scene items to, these items will be automatically added to the scene. If there are set items that should just be in some scenes and not in all, they should be categorised and added as scene items to each scene they should appear in, not as scene items added to the set. The set page show what information exists about a set. The upper part holds information whether the set is an exterior or interior set, the location if you have added that, in which episodes and scenes the set are used, and any information or description added. 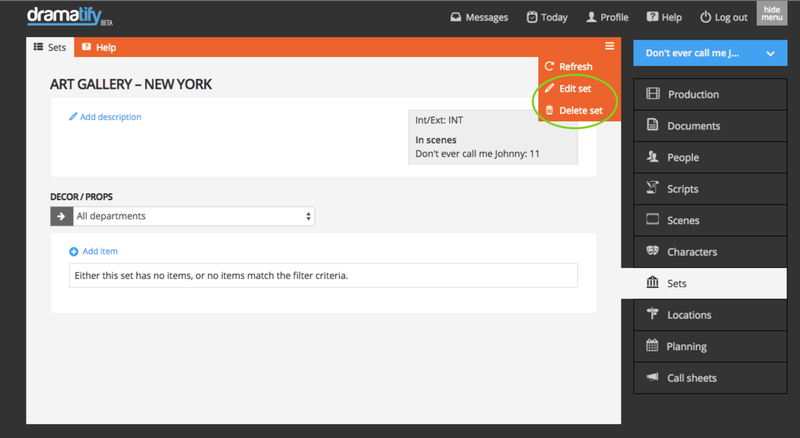 You can at any time add information to, and edit existing sets, just like we showed you when adding a new set. In the lower part of the page, you find scene items for the set. Since many people only add what the script explicitly states in the scene text during breakdown, admins and any team members belonging to the set construction and props teams can add new scene items to sets. They can also add scene item options both to new and existing scene items, for instance different brands or models of shade umbrellas to choose between. To add a new scene item, click on the link Add item. To add a new scene item option, click on the edit scene item icon and select “Add item options”. On the set page, you can also filter on departments to see exactly what scene items your department is responsible for in the current set. If you work with an existing set, follow the instructions below! Click on Sets & Locations in the sidebar menu, and then on the set you want to link a location to. On the set page, click on the edit (pen) icon. On the set edit page, click on the location dropdown and select which location this set belongs to. If you do not have any locations in the list, or the right location, you need to add that first. Read more about Locations here. 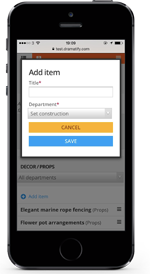 Dramatify works great on mobile, so the set construction and props teams can add scene items and option selections on the go in stores and rental facilities. I can’t see some navigation tabs! Driving directions, GPS & weather! Dramatify provides you with three types of locations. With correct addresses, you will also automatically get map links and updated weather forecasts in your call sheets. NEW! Please read about the new location report below! Where do I find Locations? 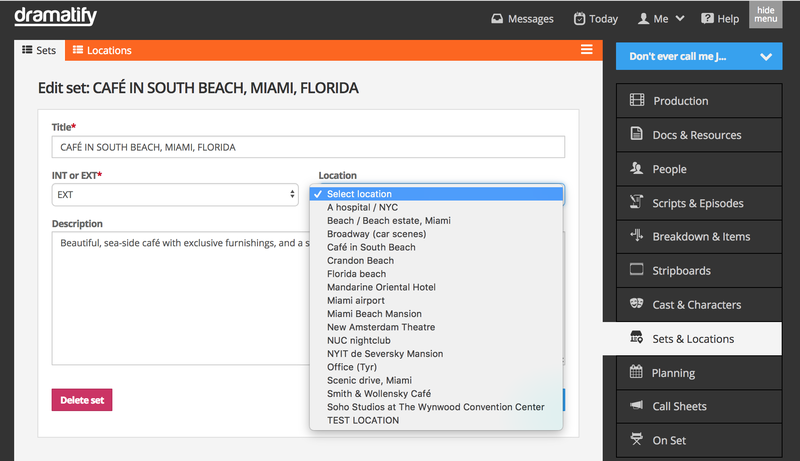 Click on Set & Locations in the sidebar menu, then on Locations in the orange toolbar. If you haven’t read the article on Sets yet, please do that first. Shooting locations are of course the most important since it’s there shooting actually takes place. A shooting location is tied to a unit base, a set and a scene. You can have multiple shooting locations per day. The automatic weather forecast in the call sheet is tied to the shooting locations. A unit base is common when not using a studio or a soundstage. It is where the team can park, prepare, store equipment, take breaks etc. In many shooting locations it is impossible due to location constraints to get a large enough area for all the team’s needs so a unit base is established in the vicinity. Medical emergency location might be an obvious need on a shoot with more physical demands like stunt scenes, but just as relevant for minor injuries when a team member need to see a doctor. Adding emergency numbers to the location description might be a good idea, especially with a multi-national team or shooting in foreign locations. All of these can be displayed in the call sheet and includes automatic links to maps and driving directions. The automatically added 10-day rolling weather forecasts that are automatically updated every third hour, are based off the shooting location. Since you can use up to five different teams per day, that means that you can shoot with correct locations and weather updates in five different continents if you wish. To add a new location, you click on Locations and then on the blue button marked Add Location. 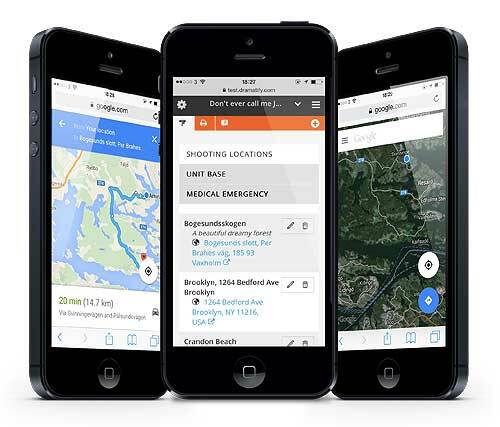 You must add a location name and a location type; shooting location, unit base or medical emergency. It is only shooting locations that are linked to sets. Unit base is the base for all activity when the shooting location do not have enough space or facilities to be a convenient choice as a base for all shooting activity. A medical emergency location is simply the nearest or preferred medical emergency facility, if something should happen. Here you also can add any production insurance information you want to be readily available. 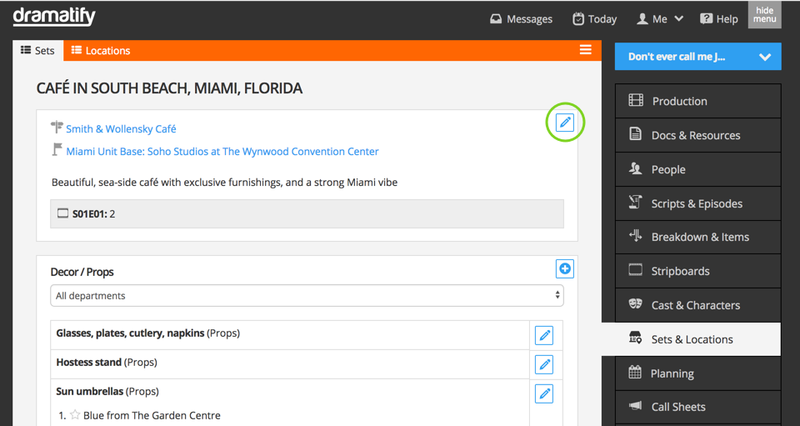 Any text you add to the description field will be published both in the location list and in the call sheets. This means you can update this as you go along, first with requirements for locations scouts and set designers, then with todo lists for safety, electricity and other practical concerns. Later, prior to the shooting day, with updated road conditions, parking instructions and any other location information for the arriving team. When adding the address, the most important part is being thorough. If you can find a correct street address, use that. Sometimes adding a street address isn’t possible because the place might not have an address, either because the location is in a “white spot” not well covered by address registers and maps, or because there is no address since you are shooting out in the wilderness. You can solve this by adding an address close by, for example a nearby town or village, in the address field and hit “Find position on map”. When you have found that position, you can use the map controls and click where your shooting location is. You’ll see that you now have GPS coordinates below. You can also add GPS coordinates if you already have them, by writing or copying them into the fields underneath the map. Click to save your new location. 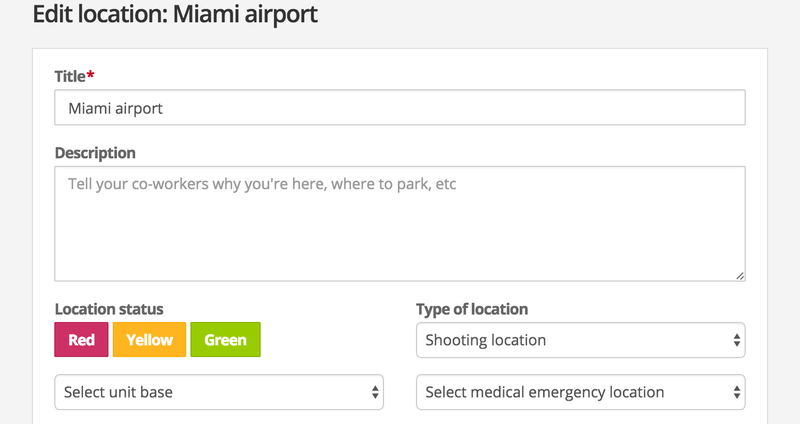 To connect a shooting location with a unit base and a medical emergency location, just click on the location in the location list and select unit base and medical emergency location for this shooting location, then save. 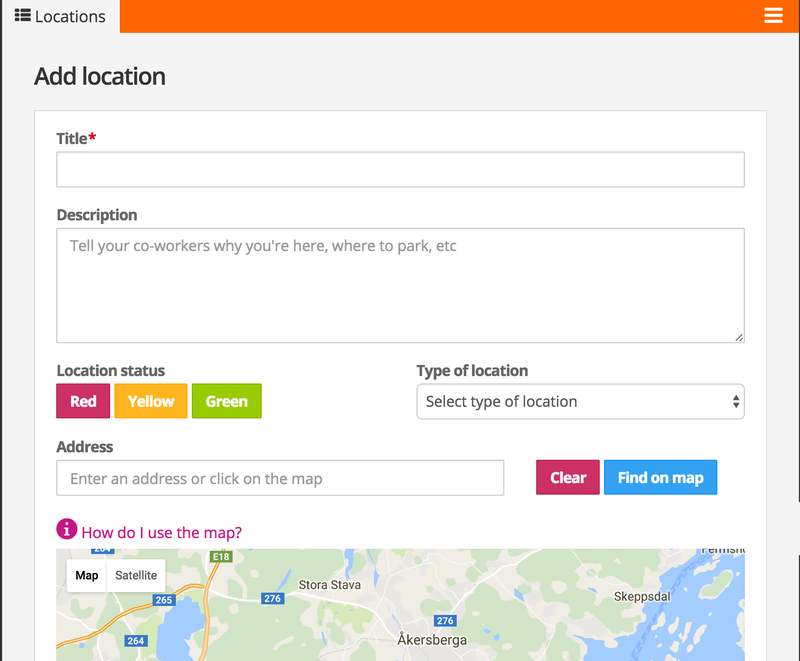 To learn at a glance in the location list, which status a location has, you can add a status colour. As described in STEP 2 above, click in the location in the location list, select the correct status colour, and click save. To connect an existing set with a location, go to Sets, click on the set you want to add a location to, and then on the blue edit (pen) icon. On the edit page, you simply use the dropdown menu underneath Location to select the set’s correct shooting location. As you see in the image, you can hide any or several of these location information categories to produce the report you like. By default the location list is sorted alphatetically by location name, but you can also sort it by production day. 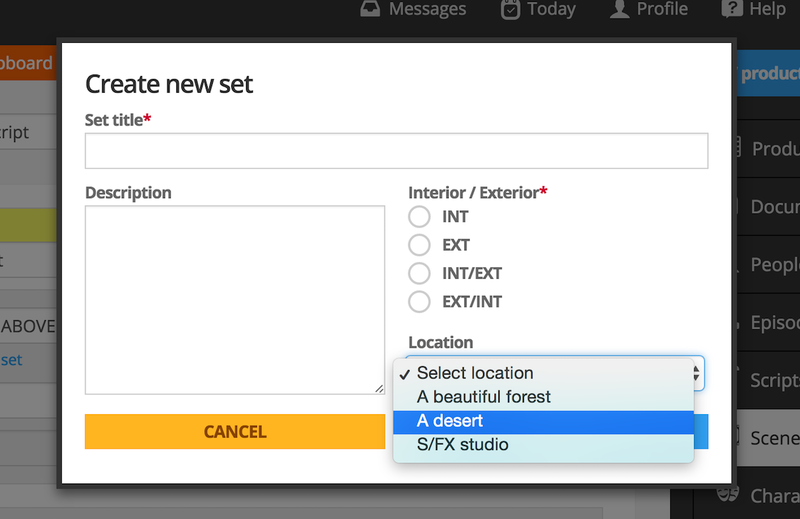 Here is a tip which can make pre-producing easier for sets and locations: You do not actually need a selected and confirmed shooting location or unit base, to add them to Dramatify. Instead you can see the adding of locations in stages. If you roughly know what kind of locations you need you can create placeholder locations that you later refine. If you import a drama screenplay, do NOT import sets, but skip them. Go to the breakdown by clicking Scenes in the sidebar menu, then Breakdown in the top toolbar. When you starting the breakdown, cmd-click (Mac) or ctrl-click (Win) on Locations and add Locations as another tab to your web browser. Look at the scene you are about to breakdown, and decide what kind of type location it needs, say a desert. Go to your new tab with the Location list, and click on Add location. In this example, we add a desert. Just add the name and if you’d like a description and a status colour. Click on the browser tab with the breakdown and reload the page. Now click on “Create new set”. In the popup add your set name, set details and add your newly created location placeholder as your selected location. Repeat steps 4 – 7 for the rest of the scenes, and you’ll have a complete set list with all the type locations that your location scouts can start working with and adding information to. All of your team have access to the scene list. This means that they can check out and research the locations beforehand. Click the Location link and you see the map of your chosen location. Click on Earth to see the satellite images of the location. At Street view, hold and drag to swing around in the image and explore the surroundings. Just click if you want to go further on a street. (Here is a video if you need more instructions). Click on Back to map, to get back to the map and get driving directions from your current location. 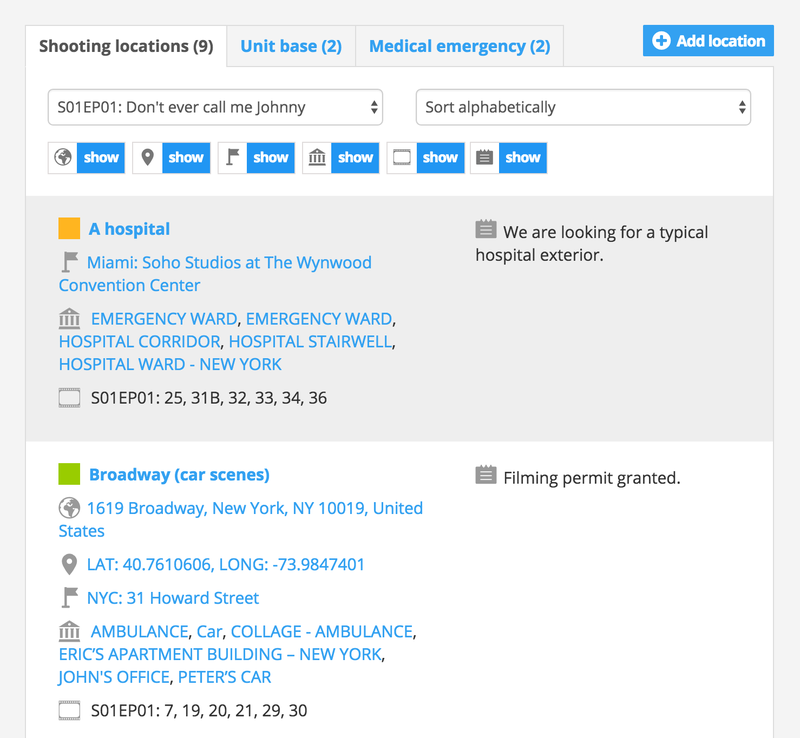 The scene list is ultra-sortable so you and your team can easily find exactly the scenes you are looking for. Click on the Location icon to see the location information and link. You can also group scenes by location, which is a great tool! If you want to print the scene list, just click on the Show/Hide bar and you can format your scene list as you like. The breakdown report consists of everything you have added to the breakdown and can be sorted on locations to give you all breakdown information on a certain location. Finally, for most of your team, the call sheet is likely the most important document when it comes to locations. Under the Location headline, you find all locations with comments. Your team members need just to click the link to get the map and driving directions from their current location in their mobiles. You can also update with manual driving directions, road conditions and parking directions that are important. Under the headline Scenes and sets, you’ll find the exact set and location for each scene by clicking on the set icon . that is automatically updated every third hour. Only users with Production Admin permission will be able to see theLocations nav tab and add, edit, administrate and delete Locations. Learn how in the Roles and Permissions article. Why doesn’t my call sheet show the weather forecast? Why doesn't my call sheet show the weather forecast? How to fix a mysteriously missing weather report. Here is how to fix a mysteriously missing weather report. 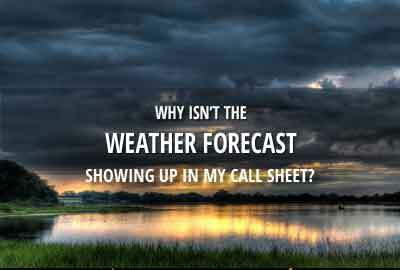 Dramatify semi-automatically adds a weather forecast to your call sheet, 10 days ahead at the maximum, and updated every third hour. The weather forecast is based on the GPS location of your shooting locations. But what if you can’t see it? Check that you have added locations to your sets. If you have forgotten, there will be no location headline nor any locations listed in your call sheet. Check that your locations actually have valid addresses. 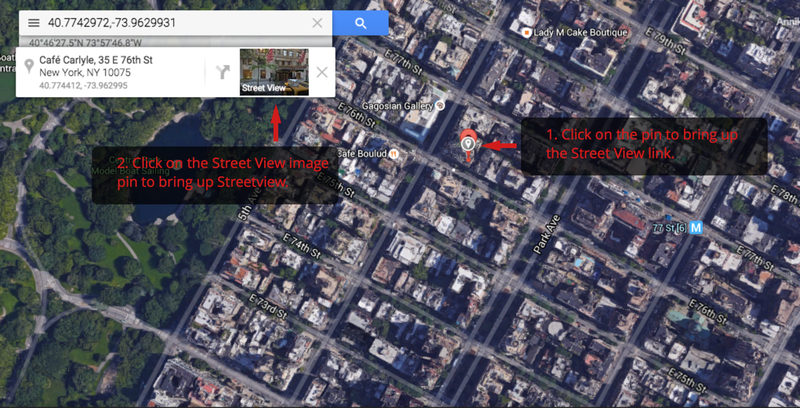 Click on the location links to see that you get a correct map address. 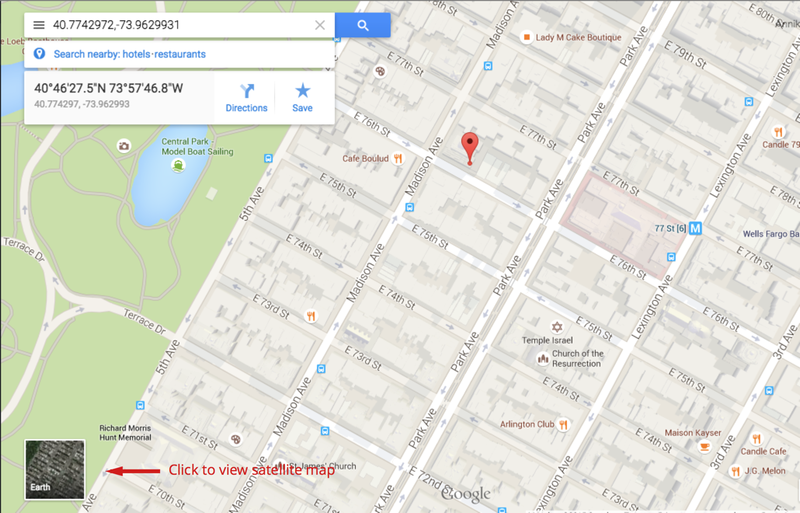 In some areas, Google Maps may not recognise the address you have given, even if it is correct. In that case, go back to your location, and find your location on the map and make sure you get GPS coordinates from your map marker.